Once upon a time, a Mercedes-Benz inline-six was the very model of smoothness and opulence and grace. It went away for some time, but now it’s finally back and boasts some impressive power and tech. Then the mad scientists at AMG got their hands on it. Meet the 2019 Mercedes-AMG E53, one of the more interesting AMG cars you can buy right now. I’m a big fan of the Mercedes-AMG E63 Sedan, and love the look of the two-door coupe. But problem is if you want an AMG two-door, you don’t have an option with the E-Class lineup—that comes in sedan or wagon form only. You’ve either got to go down a level to the C Class, or way up to a new tax bracket to get the AMG GT or S Class Coupe. Until now, at least. Thankfully AMG decided to step in and fill the gap with a very unique powerplant. The 2019 Mercedes-AMG E53 Coupe is the fast version of the successful E Class, powered by the all-new 3.0 liter turbocharged straight six engine. Yes, 53. For a three-liter engine. Confused? You’re not alone. I’m still trying to figure out the naming convention too. The E53 contends with BMW’s recently discontinued 650i xDrive (let’s not even begin to unpack that name) if you’re comparison shopping. For the driver that wants more performance, AMG offers plenty of coupes and sedans, but this new E-Class Coupe falls into a realm I like. It’s the perfect size for a comfortable coupe, has the performance figures many buyers will appreciate, and has the subtle yet fast looks you’ve come to expect from Mercedes’ performance division. A sedan E53 is also available, and there’s a cabriolet version coming as well. The AMG-ified inline-six delivers 429 horsepower at 6,100 RPM and 384 lb-ft of torque from 1,800 to 5,800 RPM. AMG claims it’ll do 0-60 in 4.3 seconds, and hit an electronically-limited top speed of 130 mph. Driving all four wheels is AMG’s multi-clutch automatic Speedshift nine-speed transmission, hooked up to a fully variable all-wheel drive system. What makes this engine package unique is the new EQ Boost system which incorporates some hybrid tech they learned in dominating Formula 1 over the past four seasons. With a 48-volt onboard electrical system on tap, the straight-six gets an added 21 horsepower and nearly 180 lb-ft. of torque shoved into your backside for short periods when you plant the gas pedal. I’m usually quick to doubt any sort of hybrid or electric assist systems implemented into more normal cars, as you’d expect some diluted tech for marketing, rather than the hotness you get in a McLaren P1, Porsche 918, or Ferrari LaFerrari. But in the case of the E53, AMG’s EQ Boost system is no joke. It’s the perfect setup that gives you the most buttery torque curve any time you mash the throttle. Torque-fill all day. 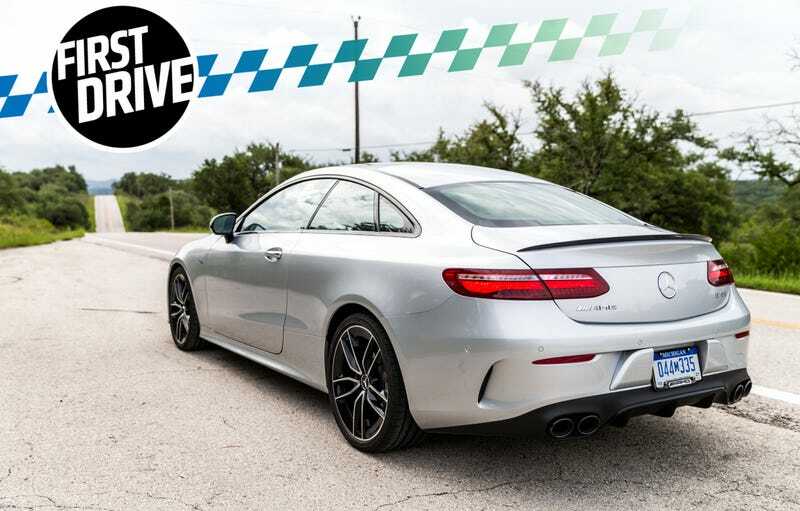 The engine isn’t wildly punchy like the twin turbo V8 in the AMG GT 63 S 4-Door Coupe I tested, which is actually a good thing. The powerband in this car is superb, and perfectly matches up with the 3.0 liter straight-six’s delivery. Any time you can get an additional 180 lb-ft of torque on tap for any pass on the freeway, or when you get an open stretch of Texas Hill Country road is to be taken advantage of. On the inside, well, I can’t say enough good things about what Benz is doing these days. The materials are from the future, the fit and finish is obscenely good, and the technology powering it all blows anyone else in the class away. The touch-sensitive buttons on the steering wheel work pretty well, and give you a lot of flexibility to control and adjust screens on the instrument cluster. Yes, you could spend hours playing with all the features and settings to meet your demands, but I can’t complain too much. It’s all so good in the AMG E53. The exterior is really clean, and the E-Class generally looks great, but being an AMG model, I’d want something that looks more aggressive. The front and rear bumpers could use a hint more grunt, maybe some sharper cuts. It’s just too similar to a normal E-Class Coupe. I want slightly larger fender flares, a beefier stance, and some massive tailpipes. Then again, this is a 53 and not a 63. Maybe that’s the intent. I miss the days of a conventional shifter on the center console. Real estate for additional driver controls and switches had to be taken up, so the shifter was relegated to the steering column, with a tiny little stalk. Curb weight wasn’t officially provided at the time of publication, but the AMG E53 Coupe easily tips the scales at over 4,200 pounds. In light of that, and having heaped praise on the engine earlier, I’d still like more power. Yes, it has that big EQ Boost surge of torque on demand, but with only 429 peak horsepower way at the top of the rev range, I’d want a little more from an AMG model. The 63 S models get over 630 HP, and that really helps move the estimated 4,400 pound package. If it had 500 or more, this thing would be a rocket. If you’re fortunate to live in a city with a commute that covers twisty roads, this car will be fantastic between your day’s blocks of reality. The steering is predictive and perfectly weighted, the chassis is balanced in any condition, and there isn’t any complaint when you get to play in the corners. I may have wanted a bit more power from this AMG, but there’s more than enough juice under the hood to have fun. As you expect from any big coupe, you can actually put adults in the back seats, and the trunk fits plenty of luggage, should you want to take a long road trip in your AMG E53 Coupe. The engineers earned their paycheck with the suspension dynamics, and whether you’re in the Comfort mode or up to Sport+, you’re still going to have a supple ride quality with any road surface being gobbled up smoothly. This could also have something to do with the 113.1-inch wheelbase and AMG’s Air Body Control adaptive damping system working overtime. I may have asked for a bit more horsepower from this turbo inline-six, but the EQ Boost really gives you extra torque when you’re pushing the car in the mid-range RPMs. Punching the gas from corner to corner is true bliss, and I love the weight and predictability of the AMG E53's steering. This car was surprisingly good in any condition I threw at it. My tester was equipped with a set of Yokohama Advan tires, and while they’re grippy and responsive, with just a hint more road noise than I prefer, they are nowhere near as great of an all-around tire as the Michelin Pilot Sport 4S. Wonder if those could end up as an option. AMG continues to belt out the high notes with any model they introduce, and this car easily met my expectations. The styling could be more AMG-aggro and a little more power would’ve been nice, but plenty of buyers will love what this fascinating six-pot engine can do. Mercedes says the E53 starts at $73,700, and with options I’m sure it could creep into the $90,000 range. A fair price for all the tech involved, and that you consider this is meant to be a forward-thinking stopgap between a “normal” E-Class and the fire-breathing E63 AMG models. If this is where electrification is going, we all win here.